Deena Warner (cover artist). Oct. 2017. A “Notable Novel of 2003” in The Year’s Best Fantasy and Horror, 17th ed. I think the newer cover was an improvement over this one, don’t you? I usually read very slowly. Somewhere around 10 to 15 pages a day is normally the maximum that I will read in a novel. And if the story isn’t interesting enough at this slow pace to keep me flipping the pages, then after a few weeks I’ll give up and close the book to never be opened again. Some people tell me I miss some good books by being this way. I figure it’s the authors job to keep my attention. If he doesn’t do that, then he’s not doing his job and I won’t waste my time. That said, I started to read “Organ Donor,” in the morning on a day off work. I figured I’d read a page or two, go run some errands. Come back, read a few more pages. Do some other work, read a few more pages. You get the idea. 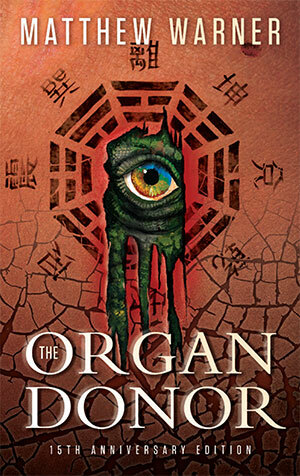 By the time I looked up from “Organ Donor,” I’d covered somewhere around seventy-five pages and suddenly realized I had to get something else done that day. Matthew Warners book grabbed me. I had to force myself to put it down. In “Organ Donor,” Matthew Warner does not describe everything in minute detail. He does not go off in subplot side trips that have nothing to do with the central story. And he does not engage in long winded internal dialogues where the main characters describe to you their philosophy on everything under the sun. In “Organ Donor,” narrative drive is paramount. This story moves like a finely tuned Porsche on an open desert highway with no Smokeys in sight. That’s to say; “Organ Donor,” moves fast. Desperate for a kidney to replace his brothers defective one, Paul Taylor, at invitation, takes his brother Tim to China where a kidney donor has been located. While there, he’s injured and needs some transplants of his own. What they don’t know is that the “Organ Donor,” did not give up his body parts willingly. He wants his parts back and he’ll walk through anybody or anything to get them. He’s a bad enough boy to be able to do it too. Matthew Warner does have an ax to grind about the harvesting and sale of human body parts by The Peoples Republic Of China. It is a gruesome and disgusting trade they engage in. No doubt about that. The narrative pulse of “Organ Donor,” does not slow down one iota because of the information that Matthew Warner gives us about the organ trade. He informs us of the facts that add to the story, then moves on. The bad guy in “Organ Donor,” is an ancient creature so powerful you’d be insane not to fear him. Halfway through the book I was telling myself, That’s why he didn’t write this in the first person. No way in hell is the main guy getting out of this one alive. You’ll have to read the novel to find out if he does. “Organ Donor,” is extremely smooth reading. It’s obvious that Matthew Warner proofread. 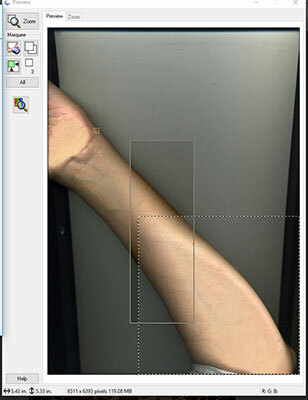 Then proofed again. Then did it some more. He has a wonderful balance between the descriptions, the action, and the dialogue that keeps the pace moving constantly. The reader does see the scene of the action as the story takes place, but it doesn’t stop the story from moving. 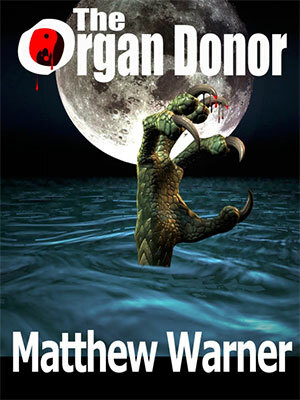 I would classify “Organ Donor,” as fun horror, not serious horror. You won’t have nightmares from reading this book, but you will be surprised in quite a few spots and have a real good time. The action scenes are graphic, but this won’t be mistaken for a gore-fest. The characters are likable and believable. You do care whether or not they live through the story. 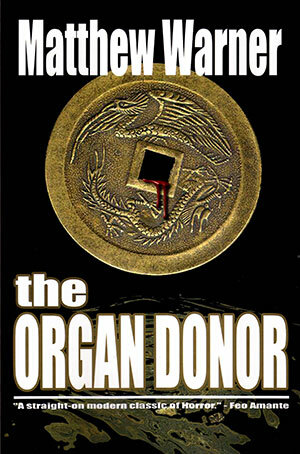 “Organ Donor” was a very entertaining book. I have the feeling that Matthew Warner is going to be a big name in publishing in a few years. Read “Organ Donor,” and you’ll see why. – Bob L. Morgan, Jr.